LOS ANGELES (AP) -- The largest study ever on stroke rehabilitation found that doing physical therapy at home improved walking just as well as a high-tech treadmill program. More surprising, patients who started rehab late - six months after their strokes - still improved. It's long been thought that there was little to gain from rehab after half a year. "We now have evidence, for the first time, that a prolonged course of therapy will have benefits," said Dr. Jeffrey Saver, director of the stroke center at the University of California, Los Angeles. "For virtually everyone, we should be doing more intensive therapy than we are." He had no role in the federally funded study, which was led by Duke University researchers and discussed Friday at an American Stroke Association conference in Los Angeles. Each year, nearly 800,000 Americans suffer a stroke, and up to two-thirds of survivors have problems walking. Sophisticated machines like robots and weight-supporting treadmills increasingly are being used, but there's limited research on how well they work compared to more traditional therapy. Such equipment is popular in high-end rehab hospitals like the one in Houston where Rep. Gabrielle Giffords is being treated after her gunshot wound to the head. The new study included 408 stroke survivors who had trouble walking. On average, they took 1,700 steps a day; normal is 10,000 steps a day. They either traveled to a facility to get high-tech rehab or received physical therapy at home. Some began therapy two months after a stroke; others started six months after the stroke to see if there was a difference. In high-tech rehab, patients exercised on a treadmill while their weight was supported by an overhead harness. As they gained speed and endurance, they could practice walking on their own. In the home program, a physical therapist helped patients do exercises to improve strength and balance, and to walk every day. After a year, both groups made similar improvements in how far and how fast they could walk. However, the treadmill exercisers were more likely to feel dizzy or faint during training, and had a higher risk of falling. What's more, fewer patients dropped out of the home therapy - 3 percent compared to 13 percent in high-tech rehab. "There's a tendency in our country to go to high-tech machines," but this study shows they're not always better, said Dr. Walter Koroshetz, deputy director of the National Institute of Neurological Disorders and Stroke, the study's main sponsor. The bigger message, said study leader Pamela Duncan of Duke University, is that longer treatment and more treatment is best. She said many insurance companies allow 20 visits, while this study gave 36. The care that stroke victims usually get now - less intense therapy for three to six months - "does not get them to the point where they could be," Koroshetz said. Doctors are working on a cost comparison, but believe the home program is much cheaper. 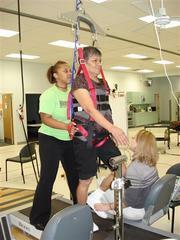 High-tech rehab requires expensive equipment and two to three therapists per patient; the home program needs only one. Doctors may be missing "silent strokes" in a small but significant number of children with severe anemia, who may be unfairly labeled as slow learners when in fact they have a medical problem. Strokes have long been known to be a risk for kids with sickle cell anemia, an inherited blood disease that mostly affects blacks. The new study found they also were occurring undetected in children with other conditions that can cause anemia, such as cancer, kidney failure or blood loss from trauma such as a car crash. "I don't think there's any reason to panic," but doctors need to consider the possibility of stroke when treating any child with severe anemia, said Dr. Michael Dowling of the University of Texas Southwestern Medical Center in Dallas. Dowling led the study involving 52 children at Children's Medical Center Dallas - 22 with sickle cell and 30 with other causes of severe anemia. MRI scans revealed fresh strokes were occurring in four of the 22 children with sickle cell, and two of the other 30 kids. "Silent strokes" - evidence of damage but no obvious symptoms - were found in three of the 22 sickle cell patients and seven of the other 30.